Our Goal is to provide you and your vehicle with the best quality and performance product from within the Shell Helix Car Engine Oil range, Shell offers a range of car engine oils designed to match all environments and engines. We offer a large choice from fully and semi-synthetic motor oils to mineral oils. At Wrack Auto Electrical we have your needs in car engine oils, covered. Check also out our Car Battery range – we offer you FREE battery tests too! Our products of choice in the fully synthetic Shell Helix Car Engine Oil range are Shell Helix Ultra 5W-40 and Shell Helix Ultra ECT 5W-30. Shell Helix fully synthetic motor oils not only help protect your car’s engine when exposed to everyday motoring that may vary from motorway driving to stop and go when you get caught in traffic, but also in the diverse climate situations that we encounter all year long here in New Zealand. With our constantly changing weather, you also want to make sure your Air Con is working fine, it might be time for an Air Con recharge. The special formula of Shell Helix fully synthetic motor oils, is based on 100% synthetic stock and high-quality additives which achieve performance levels that are higher than both semi synthetic and mineral oils. The Helix Ultra range also provides a special active cleansing technology to take care of your engine in the best way possible. Shell Ultra Helix Synthetic motor oils stand for high performance with high protection for your car’s engine. 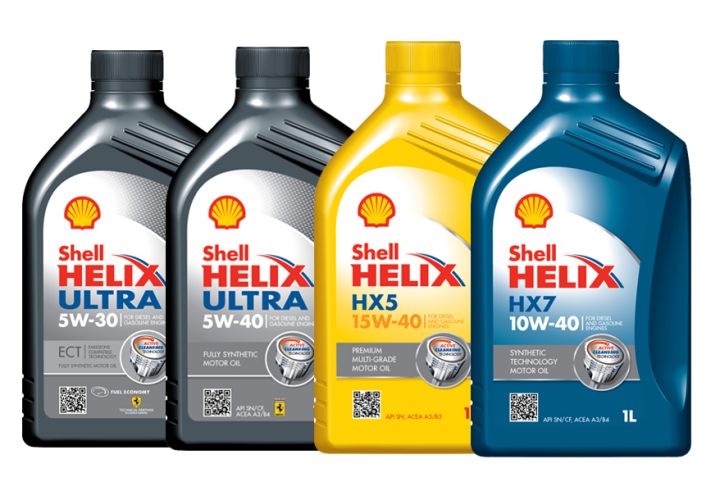 In the range of the semi-synthetic motor oils we offer Shell Helix HX7 10W40 in different volumes. Like fully synthetic motor oils, the semi-synthetic oils also help protecting your engine, using the Shell Helix active cleansing technology. Semi-synthetic oils use both synthetic and mineral bases stocks in order to achieve a higher performance than mineral oils alone. Shell Helix synthetic technology motor oils go on cleansing and protecting to help keep your engine feeling like new, and they provide low oil consumption properties for a less frequent top up. Our product choice in the Shell Helix mineral motor oils range is the Shell Helix Shell Helix HX3 20W50 and H5 15W40 in two different sizes. Mineral motor oils keep your engine clean by protecting your engine against harmful sludge. Mineral motor oils are the product with the right properties for lubricating engines from the naturally occurring crude oil fraction. Not sure what Shell Helix Car Engine Oil you need for your vehicle? Simply give us a ring and we’ll be happy to help you, by finding the right product for your vehicle. Or have a look here yourself.